Lucky me, I grew up with both Italian and Mexican step-grandmothers who loved, loved to cook and feed their large families delicious home-cooked meals. Both grandmas (I never thought of them as “steps” would not let you leave their house without something yummy to eat. My grandma Annette, was a second generation Italian and cooked everything from scratch. Even in her later years, when she was blind she still managed to make her own pasta, and fill our tummies with her delicious cooking. I was really close to grandma Annette, for some reason I was the only grandchild that enjoyed going to Catholic (in Latin) church with her every Sunday. I am not Catholic, but something about the ritual and ceremony of Sunday Mass resonated with me as a child and teen. I wish I had some of her recipes written somewhere, but alas we never thought to jot them down and now she has passed away. 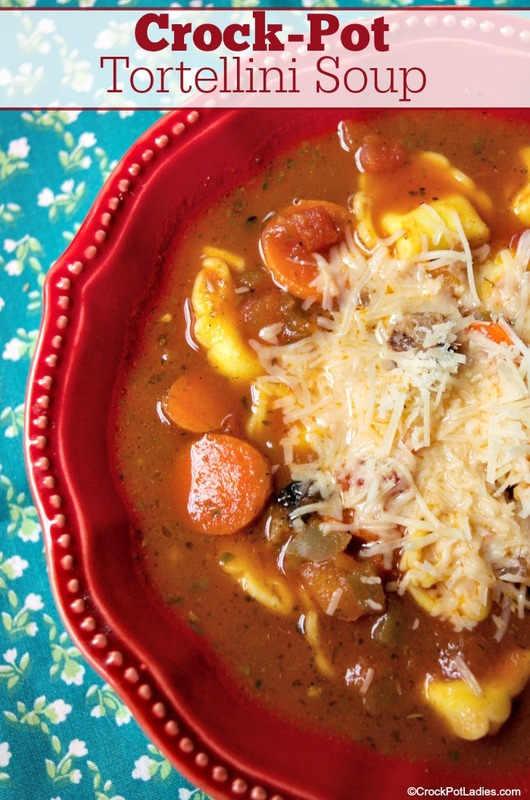 So this recipe is inspired by a warm and hearty soup she used to serve to us on Sunday’s. 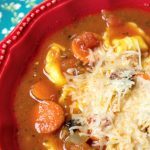 It is a chunky soup filled with fresh vegetables and cheese filled tortellini pasta swimming around in a tomato based broth that hits the spot! I like to eat my soup with a healthy grating of Pecorino Romano cheese and a thick slice of crusty Italian bread. I think my rendition actually did the memory of grandma’s soup justice and tasted pretty much how I remember it. Even though this is cooked in the slow cooker, the vegetables held up nicely and were still fresh tasting. 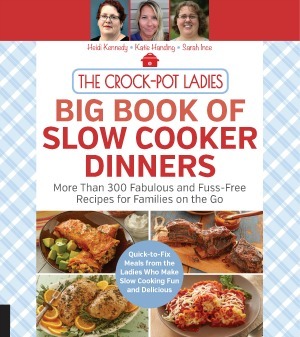 They key is to not to cook it too long in the slow cooker. Just long enough to meld the flavors, soften the vegetables a bit, then near the end to cook the store-bought tortellini pasta. My entire family liked it too. Even the kids raved about it. My son, 8, has recently become a picky eater and is on a meat strike, but even he ate an entire bowl full! That spells success in my book! If you try this recipe, please come back and let me know what you think! Add all ingredients except cheese tortellini to a 6 quart or larger slow cooker and stir to combine. 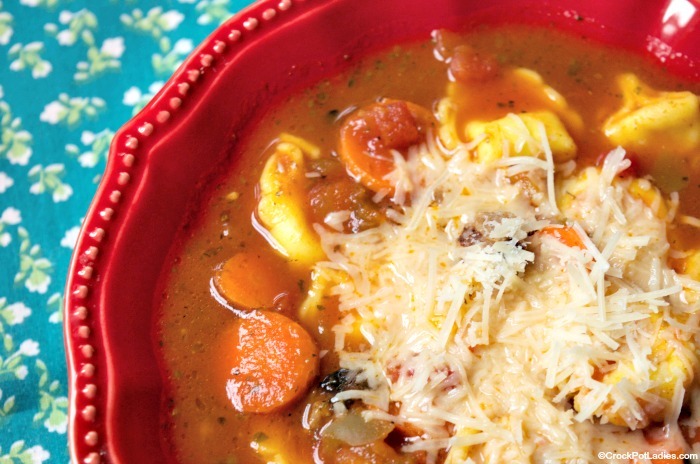 Add tortellini pasta to soup, stir, recover and continue to cook an additional 30 minutes on HIGH. Ladle hot soup into bowls and top with Parmesan or Romano cheese if desired. Serve with grated Parmesan or Romano cheese sprinkled on top of soup and fresh crusty Italian bread for sopping up the broth. To make a vegetarian version omit the sausage and maybe add some canned beans and use vegetable broth! Nutritional information is based on soup alone, not the bread or cheese. This soup looks amazing! I love tortellini and sausage! Yum! It is pretty amazing. So far the best soup I have ever made in my crock-pot! Is the tortellini fresh, frozen, or cooked before you add it in? Looks delicious and I can wait to make this. Hi Tory, the tortellini is the fresh kind you find in the refrigerated section of your grocery store. You could use frozen too, just cook it a touch longer to allow the frozen tortellini to cook all the way through. This is in the crockpot now! Can’t wait to see how it turns out … I have 3 extremely picky eaters (including one hubby!) so I shredded all the veggies pretty finely so they’re not as noticeable! Have you ever done that? I sometimes do that too Brianna. Hey a mom’s gotta do what a mom’s gotta do to get those kids to eat their veggies! Can this be frozen? And how would you recommend reheating it? I have never personally frozen this soup but I and going to guess that it can be frozen. The only issue I foresee is the pasta getting mushy as pasta tends to do when frozen in a liquid like this. What I would do is cook up the base of the soup and freeze that and then reheat that and add the tortillii near the end since it only takes a few minutes to cook. If you have the soup already cooked and just want to freeze it then go ahead and freeze it. I would thaw the soup then rewarm slowly in either the crockpot or on the stove top and just expect that the pasta might be a tad mushy. I have frozen it even with the tortellini and it was fine the tortellini a little looser but so good! !